It's good! A lot like Maroon 5 back in the day, and quite funky. <br><br>Well it was great. I dunno why, but these new Olly Murs tracks (from the album 'Right Place Right Time', such as 'Army Of Two' and 'Dear Darlin'') have the tendency to sound great at the beginning, but boring and exhausting over time. 'Heart Skips A Beat' and 'Dance With Me Tonight' didn't have this problem. Olly Murs is the cheesiest most predictable pop star out there and this particular song as already pointed out is actually called Misery by Maroon 5 but due to that single being a flop of sorts perhaps meant it was just off the radar for a backlash.<br>Add to the mix rent-a-rapper Flo Rida and this is just annoying, time for something fresh i think. 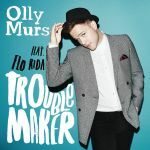 Olly's fourth UK#1 and Flo Rida's fifth UK #1. UK#1 and Ireland#3. US#25. Quite lame.<br><br>But... the chorus is kinda catchy. Nach den ruhigen Stücken die er nach Heart Skips A Beat rausbrachte wieder was flottes.Und dann noch die Combi mit Flo Rida. TOP !!!!!!!!!!!!!!!!!!!!! !<br>Riecht nach Hit.Auch wenns bissl Maroon 5 like klingt. Kein Troublemaker, für mich aber auch kein Top-10 Hit.<br>#45 der österreichischen Jahreswertunng.